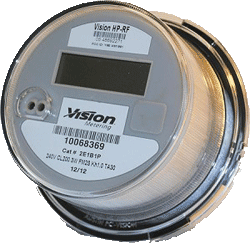 The XT Platform is the “fully-loaded” kWh meter offered by Vision. In addition to having all of the standard features of the ST platform, it also provides in-the-field Demand reads and it is compatible with multiple AMI solutions. This meter is ideal for systems utilizing kV billing or in need of a low-cost smart metering solution. The Vision XT Meter is packed with capability. When interrogating the meter with Vision’s 20/20 software, you can view any or all of the variables listed above and look at how the customer is using power. Instantaneous Phasor Diagrams are available to view what is happening at the customers site in real time. You can also save the diagrams and other information to review at a later time. The Vision XT meter has several communications options ranging from ERT radios to state-of-the-art AMI modules. Whatever your remote reading needs may be, Vision Metering has a high performance, cost-effective option for your company. Vision Metering has partnered with Nexgrid to provide a robust multi-mesh AMI solution. The meter can be can be supplied with a remote disconnect switch (XT platform only) and magnetically shieled CT’s. Nexgrid systems utilizing Vision meters have been deployed around the United States. The Communications Module integrates inside Vision Metering’s electricity meters to provide wireless networking, both back to utility OT/IT systems and into the customer’s home or business. The Communications Module includes a highly reliable, IEEE 802.15.4g standards-based Frequency Hopping Spread Spectrum (FHSS) radio that provides two-way networking capability. Vision meters can be ordered with up to 5 High Power ERT radios. Vision Metering’s Data On Demand system provides real time energy consumption values using a robust 900MHz RF star network. Each endpoint is metered using a Vision meter equipped with Data On Demand radio and communicates directly with a RadioGate. The RadioGate collects the data and delivers it to the EndSight data collection system on the end-user’s network. ©2018 Vision Metering. All Rights Reserved.